Door fishing is the best! You kids need to grow longer paws. You seem to very skilled at fishing Daisy. Chip did not like closed doors. He was very good at that type of fishing. Harley looks just like my Chipster when he would do that. Is your Mommy having fun with you?? I bet that makes the kibbles taste better! Get that treat Harley. We love to do that too. Have a fantastic day. I'm loving the pictures... Need a long reach for that one. 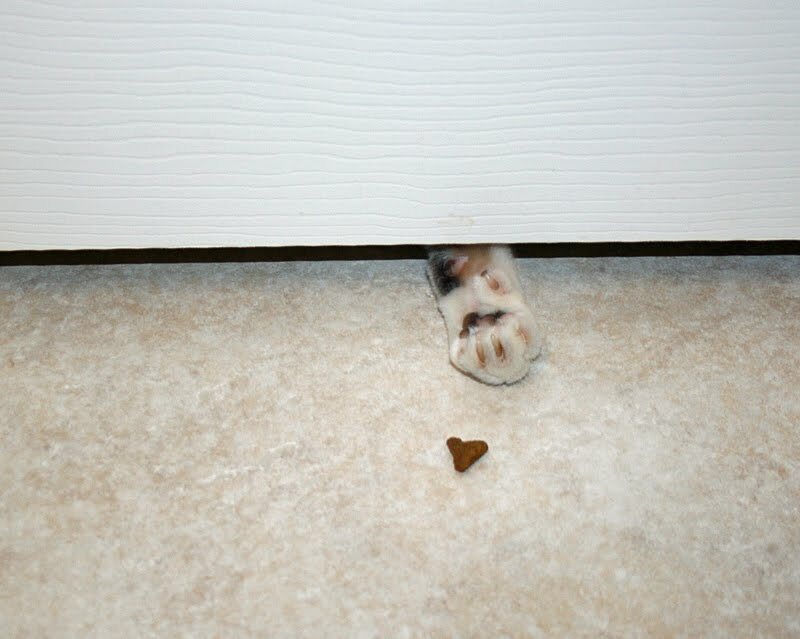 I love when you are going potty and that little hand reaches under the door. ;) I hope you reach that mousie!! Let me know if you catch anything! 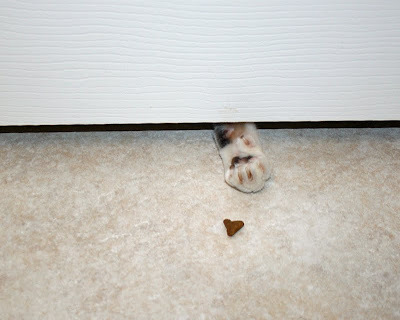 Hahaha, Its like a door-rat-fishing..
That first picture is so cute with the little paw under the door, and then the second one looks rather lethal -- good thing it's only a treat. Is that Daisy or Harley in the third shot? 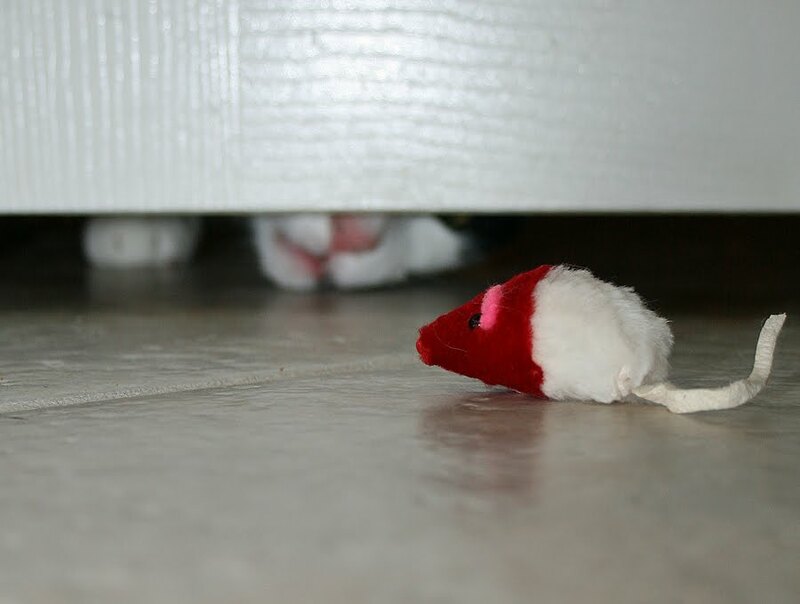 Either way, watch out mousie!!! Just a little more stretch and you'll reach your prize. REEEEEEACH! Daisy, I think you have a good shot at that cruncher, but the little fishie may be out of Harley's reach. Oh, how funny. Both of you are there! What great photos. I love them. We hope your Mommy helped you catch that treat and that mousie after the camera was gone! Oh you have lots of things to go fishing for! Gotta learn to open them doors! Hee hee hee! Too cute. Did you get the treat? Well Miss Daisy, did you get that fishy or did the mousie get it? Harley, you are the smartest most thinking kitty I know! Way to go. 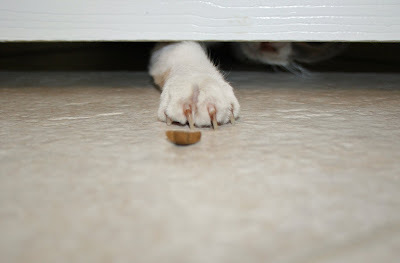 Me and mommy love seeing arms stretched out retrieving things from under doorways. So close and yet so far - we hate when that happens! We hope you were able to catch something! There's always something good on the other side of doors! so cute. i love it when my seymour and coco reach for me or other things under the door. i always tickle their paw...he..he! Did you two get the treats & fish? Sometimes Daisy you just make me laugh!!! This was so lovely and So funny!! Hope you guys got 'em! Have you thought of hunting there some big game in the hay field. I seriously laughed so hard...I remember a cat doing that at my house and a friend saw it and asked me if my house normally grew things. I said no, why? and she said because my door just grew a paw, lol.